Now that we've had our first American Dream Movement summit, what is next? 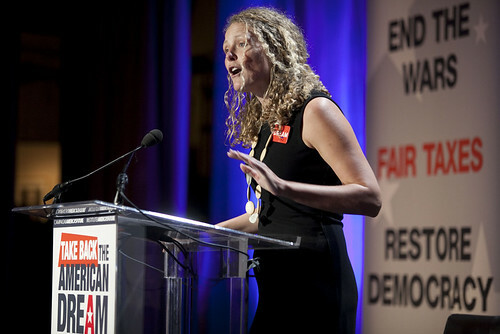 Rebuild the Dream co-founder Natalie Foster took the stage at the Take Back the American Dream Conference to answer that very question. With the spark of massive resistance in Wisconsin, the American Dream Movement has steadily chipped away at the austerity agenda around the country and it's working. Our political leadership has begun talking about creating jobs, not cuts. The president put an American Jobs Act on the table, and progressives in Congress are pushing a bold strategy to create jobs as well. But that's not enough and we’re not done; we're just getting started. So what's next for the American Dream Movement? Natalie proposed an audacious three-point plan. 1) American Autumn: November 17 National Day of Action Starting with a wave of actions around the country next week (October 10-17), we’re building towards a massive day of action on November 17. On that day, we will hold members of Congress accountable -- we will punish those who oppose job-creating legislation, and we will praise and support those who push hard for real solutions. We need jobs, not cuts. We need economic growth, funded by making the wealthiest pay their fair share. We will especially target members of the so-called Supercommittee, and all of the 12 members of the Supercommittee will have to directly contend with residents in their states and districts. (The Supercommittee is the special congressional committee charged with coming up with $1.2 trillion in deficit cuts by Nov. 23. Failure to do so would trigger automatic spending cuts in defense and domestic programs.) You can sign up at November17.org. Use that website to get more information on the thousands of actions that will be held on (you guessed it) November 17. 2) Run 2,012 American Dream candidates in 2012 Natalie called on us to build power at the ballot box, from the bottom up. That’s why we’re recruiting and supporting at least 2,012 American Dream candidates to run in 2012 -- in all 50 states from school Board on up to Congress. New Organizing Institute’s Candidate Project, led by Carlos Odio – a rising American Dream leader, and Progressive Majority and are taking the lead on this. 3) One million local leaders Although electoral power is key, change doesn’t begin or end with electoral politics. We’re calling on one million Americans to step up as American Dream leaders. We started in churches and synagogues, union halls and living rooms — and that’s where we’ll grow. How will we engage with a million people? It will take hard work, to be sure. But it is within reach. In just the last three months, hundreds of thousands of people have taken action online, and tens of thousands of people have met at local American Dream meetings in every congressional district in the nation. And we've barely begun. We’ll hold house meetings and teach-ins on economic policy, we’ll work with entrepreneurs to test out new shareable ways of working together. And we’ll spark scholars, creatives, videographers, graphic designers to engage their communities and produce and create what a movement needs. After Natalie's presentation, I asked her to give a message to our readers. Here's what she said: "This historic moment is YOUR moment. The American Dream Movement is YOUR movement, a common banner under which we all can march. Th American Dream Movement must be led by local leaders and volunteers in every community, driven from the ground up. "It must be led by YOU. Let's join together. It's time." .